As I write the diary below...memories begin to pour back along with the anxiety and tears that we all experienced at the time. For many of us, the scars of war will never heal. Nor should they. 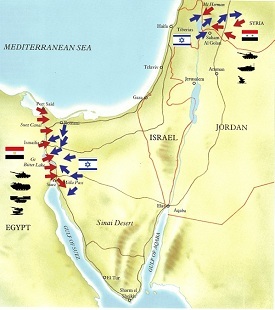 Israel was unprepared for a surprise attack by Syria and Egypt. 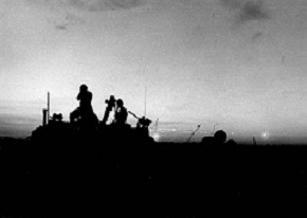 The Yom Kippur War took the lives of 2,688 Israeli troops. 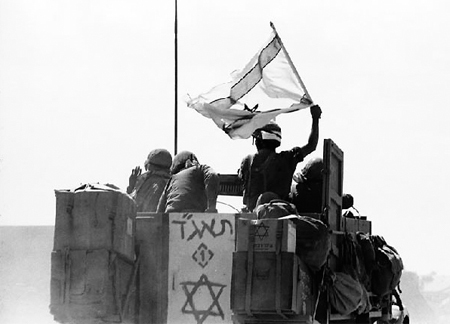 Sitting in the relative safety of a suburban Long Island home, I first heard news reports of Arab armies attacking Israel on October 6, 1973. I sat down on one of the soft couches with my father to watch Abba Eban address the world on a color television set. I watched as this portly man in a neat two piece suit wearing large black glasses walked down an aisle at the UN and took his place at the podium. He spoke clearly with an English accent. A voice which embraced all of the desperate passion of the moment. His English accent was a surprise. To an American, we are seduced by this English UK mother tongue twisting of vowels and nouns. It says to the American ear that the speaker is authoritative. 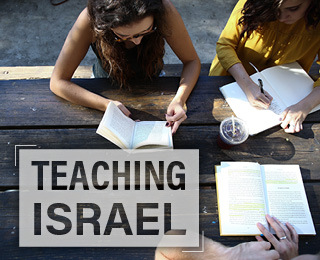 Weighing each and every word that Eban smoothly articulated, I awaited the latest news of what the Israelis were facing. Then I heard a defining sentence. "This was a brutal and unprovoked attack in great mass by Egypt and Syria across the cease-fire lines," said Eban. Israelis don't speak like this. They never admit weakness. To use the word "brutal" meant that Israel was bleeding. At that point I knew that Israel's very survival was in jeopardy. I said to my father that I was going to go to Israel to help out. He shrugged with disbelief. He must have asked himself where would a 20-year-old find the money and an aircraft which would fly a young boy into a war zone. My father was a Jewish activist, he was and remains a Zionist. He served as the Chairman of the Transportation fund raising division of the United Jewish Appeal, was the president of his Temple and was a consultant to Israel's Ministry of Defense in New York. I had been in Israel only the year before as a Kibbutz volunteer. It was the most romantic summer of my life. To wake up at sunrise, to be driven by tractor into the lush green banana fields and then to sit down for a breakfast of fresh scrambled eggs with halvah was paradise. It was Ma'ayan Baruch, a kibbutz located directly on the Israeli-Lebanese border which was founded before the War of Independence by South Africans and Americans. I also had family in Tel Aviv, warm people who greeted me as if I was one of their sons. Israel was all that I expected it to be. A romantic, exotic and pioneering state where all of the people pulled together. The collective warmth was infectious. As I left my many months on kibbutz, I promised that one day I would return to this Jewish state and make it my home. As Eban walked off the UN podium and the news anchors began to deliver commentary, I walked into my bedroom, closed my door and called Kibbutz Aliya Desk - a center for volunteers to Israel located in New York City. I asked if I could immediately volunteer for a kibbutz in Israel. I expected a negative response. Who had time for some kid from New York who wanted to pick apples at a time of war? "If you come to Israel to assist us and promise us that you are not coming to fight, then we may have room for you on a flight in the next few days." My parents were in disbelief. I remember how my father was proud of my actions, as my mother cried and begged him not to let me go. But as a young man, I had decided my course and now had the means to implement it. I arrived at the El Al terminal and was rushed by security up to the El Al VIP lounge. Now it sunk in. Here I was with a few hundred other people going off to war. 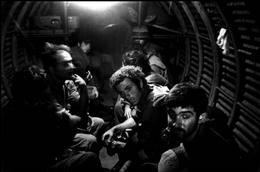 We knew our lives were expendable as soon as we would step on board the aircraft. Tears flowed in that terminal. It was a quiet, surreal scene, where I held back my own tears as not wanting to make the situation more tense. On October 11th, I kissed my mother on the cheek, smiled and said I would call her upon arrival. "Don't worry," I said. "I am going to pick apples, I will not be shooting anyone." I stepped on board the aircraft, now somewhat afraid of what was in front of me but overshadowing this fear was the knowledge, the Jewish adage: "If not me, then who?" There was no conversation on the plane. It was not as if you were traveling to Jamaica on vacation. There was no laughter, only quiet reflection. Many of us thought to ourselves, would we actually make it to Israel or be shot down in flight? I sat next to a medical doctor who had volunteered as well. He assured me that all would be okay. He said that his specialty was trauma and that he was now assigned to an army hospital in Israel. I was in good company. 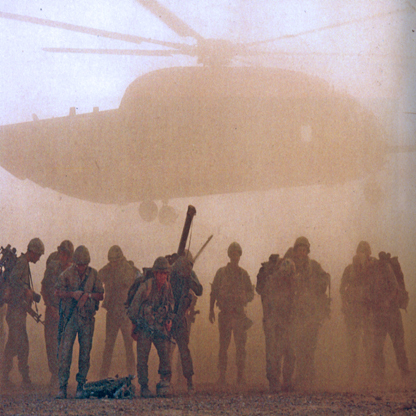 These were people of action. This was the Jewish nation standing up and being counted when it was most needed. As we approached Israel, the pilot made an unusual announcement. He wanted us to close our window shades. I guess the pilot, as many El Al pilots who had served as Israeli combat pilots previous to taking these commercial positions, knew a bit more than we did. Having a "lit candle" of civilian passengers flying into a war zone was not the best tactic that one would suggest. As I looked outside one final time, I saw a combat fighter flying off our left wing just yards away. Then I heard the pilot make another announcement. "Don't worry - the combat jet which is flying next to us is one of ours." Now the reality of war was all around us. There was no turning back. If I lived through this - so would Israel, if I died then I would have given my life no different than those who had fought the Nazis. As the plane's wheels touched Israeli soil, we applauded. We were not applauding the pilot and listening to tunes of Hava Nagila - we were applauding the fact that we were alive. 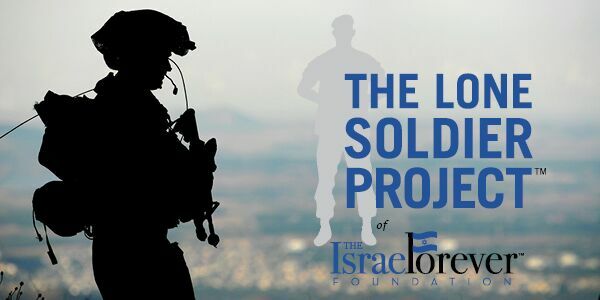 That we had made it past the first hurdle and that we were only minutes away from physically joining our brothers and sisters in their defense for Israel's very existence. The terminal was empty and dark. All of Tel Aviv was blacked out. Window shades were drawn on all of the homes and buildings we past. Even the headlights of cars and buses were painted blue. We were a group of about 40 people. I later found out that we were a few hundred foreign volunteers accepted from thousands who had applied. 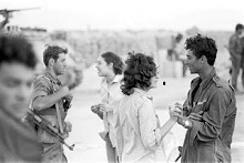 We were the "official Israeli war volunteers" and we were greeted in the kindest manner. 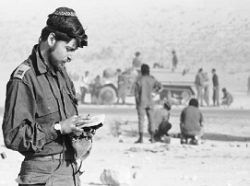 But we never forgot for a second that we were not on the front line - that there were others who were in far more danger than us and those Israelis who were assisting us in Tel Aviv were related to brothers, husbands and sons now in uniform. 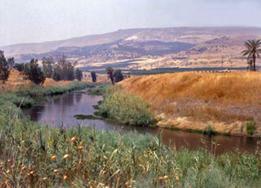 We were taken by bus to a large youth hostel in Tel Aviv by the HaYarkon River. Holding luggage and wearing backpacks we mingled quietly outside on the grass next to the buildings. Then someone started to read our names out. As they went through the list, we were instructed to enter one of the buildings. As I walked in, I saw several dining tables all with candles burning. This was not Shabbat. We were in a blackout. The mood was eerie. Little conversation, no laughter and much reflection. A bearded man in his thirties stood up and made a prayer. He then spoke in English and thanked us for coming to Israel. He said that we would face very difficult days ahead, but with god's help, that we and all of Israel would be fine. We began to drink hot matza ball soup. You could not escape the tension and anxiety. This was not the smiling Israel I had known from a year ago, neither was this Long Island. 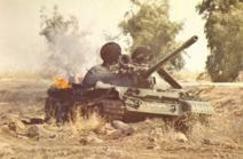 We were together, but yet alone as we sat and ate our first meal in the Yom Kippur War. After finishing our dinner of chicken and mashed potatoes, we again mingled outside on the grass. We were taken to our rooms by flashlight. We awoke early in the morning and after a brief breakfast, again heard our names called out. We were taken to buses which would take us to Tel Aviv's Central Bus Station. It was a busy scene of soldiers coming and going. Then I spotted a long line of dark green ambulances with the white and red Magen David stars on their sides. These were military ambulances. With curiosity, I slowly walked over to one of the vehicles. I discovered that it was an emergency mobile blood donation station. I looked at the soldier in charge and gestured that I too wanted to donate blood. He wrote my name down and I stood in line. Next to me was another young war volunteer from France. He spoke no English and I knew no French. We just smiled at one another. We were both asked to enter the ambulance at the same time. We rolled up our sleeves and as our blood began to drip into plastic bags, we again smiled at one another, tears began to form, we did not need words. As we both stepped off the IDF ambulance, we shook hands. I said good luck in English and he said the same in French. We now looked for our buses which were to be identified by number. Buses which were to take us somewhere in Israel, it was anyone's guess. After a few hours I found myself on the Israel Jordan border. It was a quiet journey. 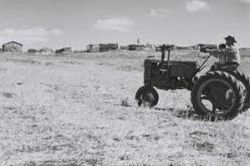 The dusty roads were vacant except for an occasional IDF truck, jeep or tank quickly rolling by. About five of us stepped off the bus at Kibbutz Beit Zera. Located in the Jordan Valley about 15 minutes south of Tiberius, Beit Zera was another Ma'ayan Baruch, another magical, romantic kibbutz with palm trees, apple orchards and haystacks. We walked past the main gate and were greeted by the head of the volunteers. A one-armed Israeli Kibbutznik in his late twenties. His warmth was evident from first eye contact. A warmth which remained consistent throughout the ugly, dark days ahead. He led us across a large, open grassy field to a group of wooden huts. This was to be home for the next several weeks. All seemed tranquil, as this is the normal environment for a Kibbutz. But the tranquility lasted less than 24 hours. 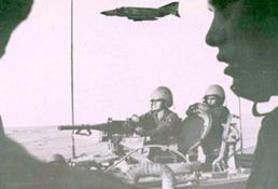 At first it was the super sonic booms of low flying IDF aircraft intercepting Syrian fighters. 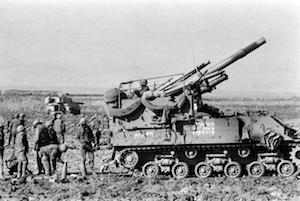 We would run out of our shacks after being rattled by these heavy thuds, thinking that the Kibbutz was being bombed. We would stand out in the open field, point our binoculars towards the sky and watch dogfights taking place above us. We could make out the Israeli planes from the Syrian MIGs. It was always the Syrian MIG which would be seen exploding or going down in a trail of grey smoke. We would yell in exhilaration for our brave brothers in the sky, we would laugh and walk proudly back to our work or beds. But this Hollywood show where the good guy would always win, would not last for long. Another dogfight, more missiles, but this time through the binoculars you could clearly see the Magan David Star painted on the tail or was it a wing, drop from the sky. We fell silent. We cried. We walked back to our beds for a sleepless night. After two days on the kibbutz I sensed something was wrong. There were almost no men on the kibbutz. They were all in the reserves. Our job was to keep the kibbutz functioning. Whether it was in the factory, the cotton fields or in the kitchen we did our best to keep morale high. On the third day, I walked over to the volunteers' bulletin board and my mouth opened. On a piece of yellow ruled paper tacked onto the cork was a sign stating: Premilitary Training for Volunteers. 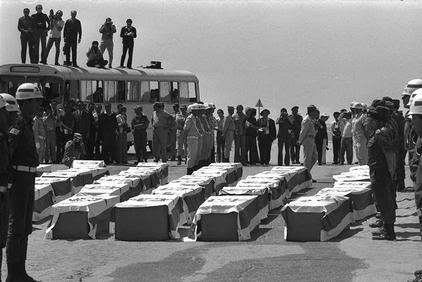 One of the conditions for which many of us were not pleased to accept was that we were not going to Israel to fight. Now they were offering us weapons training. Within 24 hours we were taught how to fire World War 2 carbines, instructed where we could find mortars and grenades and the positions around the kibbutz that we should take up if the kibbutz was attacked. There was no more magic or romanticism associated with this kibbutz. The war was not going well and we felt it. I spent one day working at the kibbutz pool and became friendly with the man who managed it. I didn't see him for a few days and then I spotted him in the kibbutz dining room. He was sitting at a table by himself. With a big smile I walked over to him and asked him how he was. He responded: "my son is dead." I had no words. I was in shock. We were all in shock. 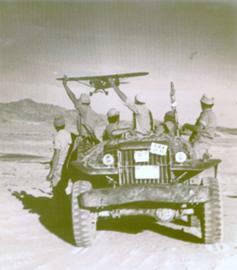 As the war worsened for Israel, one afternoon all of the volunteers were called into a meeting set for 5:00 p.m. Having been on a kibbutz, I thought nothing of this meeting except for some Kibbutz bureaucracy about to take place or the Kibbutz secretary was going to introduce himself. Without wasting anytime he said these words: "The situation has become very bad. We will be lucky to see the sun set this evening … even luckier to see the sun rise tomorrow morning. I thank you from my heart for being here, for helping us, now I wish all of you and us good luck." You could hear the proverbial pin drop on the floor. What was actually happening in the south that for which we were completely unaware of was that Israeli troops had successfully crossed the Suez Canal. They were now marching towards Cairo and Moscow had just told the US that if the Israelis did not immediately leave Egyptian soil, that they would deploy paratroopers within 24 hours against the Israelis. We were facing World War Three. 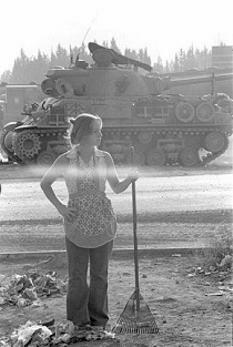 The Kibbutz secretary, having been briefed by IDF home front command intelligence, expected the Jordanians to enter the war and overrun the Kibbutz. We walked slowly back to our shacks. Not a word was muttered. We were just told that we were living our last hours. All we could do was look at one another. We began talking about our families in the States, in the UK and Australia. All of our radios were on. We tried to maintain contact with the kibbutz secretary, but to no avail. We were alone. When we stepped on board that El Al aircraft we knew very well that this scenario could take place. But none of us ever imagined that this could or would happen. We were not prepared. How does one prepare to die? It was the longest night of my life. As the sun's first rays began to peak over the Jordan mountains, over the Golan Heights which were nestled at our very door, I remember hearing the sounds of birds singing. The sound of factory machinery drilling and cutting metal and wood. The sun rose and we were alive. I put on a pair of running shoes, as I did often to start my day and set out with a run to the kibbutz entrance and then around the Kibbutz. As I approached the entrance of the Kibbutz I saw a mass of people. I slowed to a walk. Then as I got nearer I saw that they were carrying an Israeli flag draped coffin into the Kibbutz. I stared and cried. I turned around and again retreated to my wooden Kibbutz shack. I took off my shoes and just lay in bed. By this point a very deep cloud of depression hung over the Kibbutz. We volunteers, whose job it was to keep the Kibbutz functioning and keep morale high could no longer manage a smile. Finally, I suggested to my roommate Jeffrey, a schoolteacher from London, to hitchhike into Tiberius. We needed to get out of this environment. Without hesitation, we grabbed our shoes and some money and made our way to the Kibbutz entrance. An army truck stopped and we got into the back. It was a bumpy ride but it was heaven just to leave Beit Zeir. Tiberius was wall to wall soldiers. Some preparing to go the Syrian front, others with mud stained shirts enjoying some Rest and Relaxation in the many pubs. As Jeffrey and I walked into one of the pubs, we realized that we were the only civilians there. We ordered some beer. Many of the soldiers stared at us. In retrospect, they were most likely thinking to themselves why we were not in uniform. One soldier walked over to us and said something in Hebrew. I responded by asking him if he spoke English. The tension immediately turned to laughter. "You are the volunteers who have come from the States and England?" We smiled. "You are the heroes who left your homes to help us. What do you want to eat? What do you want to drink? You pay for nothing," he said. Another IDF soldier walked over to us and took out a plastic bag of green peppers. "I picked these peppers just outside of Damascus - I want you to have some," the soldier smiled. This was an ambush. A friendly ambush for as we placed the peppers in our mouths our throats began to burn and eyes began to tear. These battle-weary soldiers were having a joke on us and we could not be happier. This is why we had come to Israel. We were finally home. And we were alive. 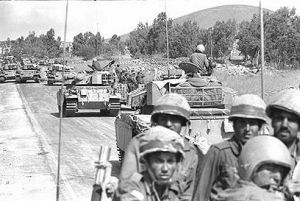 Within two days, the IDF, now fully deployed, blocked the Egyptian and Syrian advances and took the offensive in the Yom Kippur War. 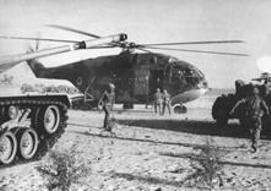 The Yom Kippur War lasted for 3 weeks, starting on October 6, 1973 and ending October 22nd on the Syrian front and October 26th on the Egyptian front. 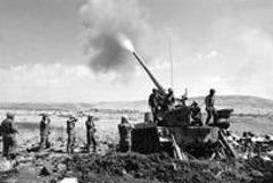 These memories of the Yom Kippur War were first written and published on October 3, 2003 by Joel Leyden, Israel News Agency.